Electric bikes (E-Bikes) are quickly taking Europe by storm and even though we’re a little later to accept this new breed of bikes to the UK, it’s an exciting time for cycling. 1) Do you have to pedal an electric bike? 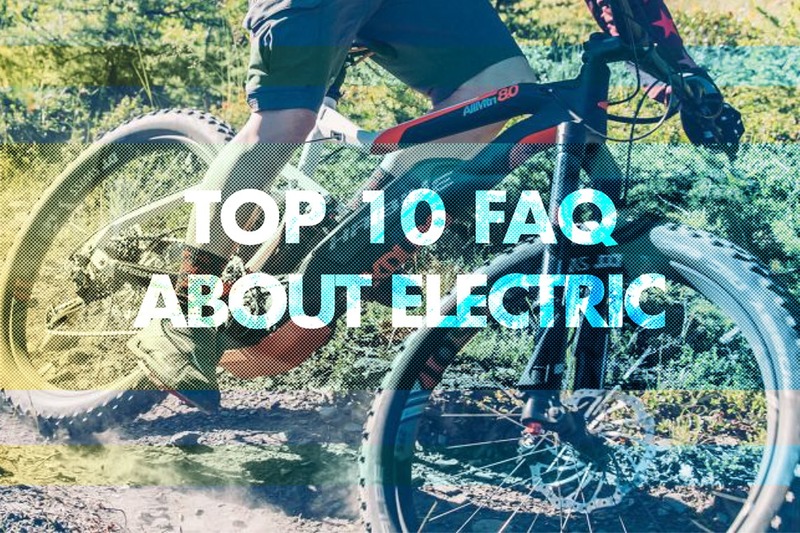 This may seem like a very basic question but we get asked this one (a lot) because of the old electric bikes that used to knock around about 10 years ago; you only pedalled in-between bursts of power with no consistent assistance running throughout your ride. With the electric bikes available now, you ride them just like a ‘normal’ bike but you have different output modes available on your motor so you can choose your level of assistance, as you pedal, throughout your ride. 2) What’s the maximum speed of an electric bike? Electric bikes in the UK are restricted to a max (assisted) speed of 15.5mph. It’s not illegal to go faster than this but any extra speed is not assisted by the motor so it will all be down to you! 3) Can you lift the maximum speed restriction? There are some places that will advertise un-restricting your electric bike so there is no maximum limit of 15.5mph assisted speed. BUT by doing this it is not only breaking the law, but your warranty instantly becomes invalid so should you have any future issues with your bike or any servicing that needs doing then we (along with all e-bike shop dealers) will refuse to do this for you. 4) How long does the battery last on each ride? Electric bikes don’t charge as you ride, but if you charge your bike after every use it will last on average about 70+ miles so you won’t have to worry about it running out of power when you’re out. This can also be lengthened by using different output modes to increase your distance; the lower the assistance, the longer the bike battery will last. 6) What is the average life of a battery? Answer: Average about 1000 full charges - this depends on the brand of battery unit but as we only sell high quality brands this is the average life expectancy of the battery. Using a Bosch unit as an example you will get 1000 full charges from flat to full before the unit will drop and charge to about 80%. A full charge is not every time you plug it in e.g. if you ride twice a week and only use half the battery on each ride (charging it after each ride) this will count as one full charge. After 1000 charges the battery will still work but it will only charge to around 80%. This won’t stop the performance of the electric bike in any way; it just means you will have to charge your bike a little more often. 7) Does an electric bike need any special maintenance? Making sure your ebike is clean and maintained like an other bike is key to keep it running as smooth as possible. The motor and head unit on an ebike are sealed and waterproof so you don’t have to worry about getting it wet when you’re out riding in the rain or cleaning your bike! With every bike we sell we offer a FREE 6 week check up so we can make sure everything is running well after your first few rides. We also recommend getting your bike serviced every 6 months as this will add to the overall life of your ebike and keep it ticking over. When we service your electric bike we also check the diagnostics and make sure the firmware is up to date throughout the head unit, battery and motor. 8) What are the running costs of an electric bike? The great thing about riding an electric bike is it’s basically FREE! Apart from the obvious charge of the electric to charge your battery after a ride, which is roughly around 7p per full charge. This makes riding an electric bike a really cheap alternative to driving and is environmentally friendly! The only other costs you will have are maintaining your bike and getting regular services like you would do with any other bike. 9) Are there any UK laws I need to be aware of? *NB* Laws can and do change without prior warning. These are accurate at the time of writing and we shall endeavour to keep them up-to-date. 10) Can You Take Your Electric Bike On A Plane? The maximum size battery allowed on an aeroplane is 100 watt hours (wh), and with the average electric bike battery size being around 300-500 wh there is no way of getting your electric bike through baggage control. Hopefully in the years to come as technology progresses we will see the battery size get smaller but for now it looks like any bike riding outside of the UK will have to be achieved by driving your bike there. Official blurb about battery size limits: Lithium metal (non-rechargeable) batteries are limited to 2 grams of lithium per battery. Lithium ion (rechargeable) batteries are limited to a rating of 100 watt hours (Wh) per battery. These limits allow for nearly all types of lithium batteries used by the average person in their electronic devices. With airline approval, passengers may also carry up to two spare larger lithium ion batteries (101-160 watt hours). This size covers the larger after-market extended-life laptop computer batteries and some larger batteries used in professional audio/visual equipment.